Chances are you rarely stop to think about scheduled inspection and maintenance for your roof. For many homeowners, the roof is the last thing on their minds. It is easy to understand why: how often do you really stop and genuinely appreciate a roof? It’s kind of an out-of-sight-out-of-mind thing. If you are like most people, you don’t even consider the roof until something goes wrong like a leak or broken shingles. By the time these issues become apparent, it is likely the damage to your roof will be so severe it will require even costlier repair or replacement. Wouldn’t it be easier to catch these problems before they reach that level? That’s where scheduled inspection and maintenance can save the day…and your bank account. What Is Scheduled Inspection and Maintenance? Instead of allowing your roof to become so damaged that you have no choice but to replace it, consider sticking to an inspection and maintenance schedule with a professional roofing company. With scheduled inspection and maintenance, you won’t have to worry about your roof requiring major repairs out of the blue. In fact, you will be able to rest easy with the knowledge that you are doing everything in your power to keep your roof protected and well maintained. 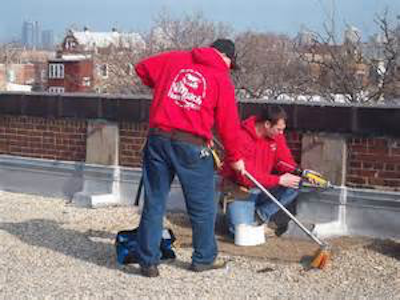 When you have a professional handling your scheduled maintenance, your roof stays in great shape. Why not do all you can to ensure your roof lasts for as long as possible? Professional inspection and maintenance makes this task hassle-free and affordable. At Montgomery Contractors, Inc., our skilled roofing team can help get a longer life from your roof. We’ll create the perfect scheduled inspection and maintenance plan to meet your roofing needs and budget. Let us put our years of experience to work for you. Keep in mind that inspection and maintenance should happen at least once a year in order to keep your roof in optimal condition. Sign up for scheduled inspection and maintenance with Montgomery Contractors, Inc. today. Give us a call at 910-220-2172 to learn more about our maintenance plan options.